We are pleased to present the artwork of this amazing family of artists. Paintings and drawings by Vicki Hart, Rashawn Hart-Campbell, Prince Matthews, Ameriss Campbell, Indigo Campbell, and Miles Campbell will grace the walls of Detroit Fiber Works, all inspired by the family matriarch, Barbara Payton. I am a Michigan artist, born and raised in Detroit. I began my artistic career early in life, exploring arts and crafts in grade school. Later, I attended Wayne County Community College as well as Center For Creative Studies, majoring in painting and drawing and interior design. My work is usually a study in nature: birds and flowers especially! I also love to explore geometric shapes and bright colors! My mediums include watercolors, acrylics, oils and colored pencils. I have worked with plaster-of-Paris and with glass, creating mosaics and sculpted pieces on canvas and wood board! I am a member of the Detroit Fine Arts Breakfast Club. I live in Downtown Detroit with my grandson where I am teaching art to future generations: my kids and grandkids! Prince Matthews, age 15, attends Cass Technical High School. He is a 10th grader majoring in Graphic Design but is also studying Photo Shop and Chinese! Prince loves to work with acrylic paints , manipulating them with rubbing alcohol and table salts for astounding textural finishes! Prince has learned the basics of painting from his grandmother, fellow artist Vicki Hart who attended Center for Creative Studies when she was younger and subsequently taught her children to paint. Prince hopes to also attend Center for Creative Studies. Prince Matthews has experienced initial success with painting, though he has only been painting a year! He is also a member of the Detroit Fine Arts Breakfast Club! Rashawn Campbell is a visual artist, writer and mother from Detroit, Michigan. She has studied art since her teen years, including Commercial and Graphic Arts at Crockett Career Tech, Basic Drawing at Wayne State University and airbrushing at Center for Creative Studies. Rashawn experienced initial success following her first official gallery showing in 2015. Her art has since been on display at Detroit’s Sherwood Forest Art Gallery and Rashawn has exhibited with 2016 North Oakland Macomb Chapter of Jack and Jill of America Fundraiser, 2016 Smallish Show at Marygrove College, 2017 Black ID show at The Carr Center in Detroit, and 2017 North Rosedale Park Great Art Great Park Art Auction! Rashawn has even had work exhibited at the Detroit Institute of Arts as a Detroit Public School student! Rashawn’s artistry covers a wide range of mediums and many subjects from love and beauty to loss and sadness. Her art imitates the realities of life, but in bold, bright, eye-catching colors and breathtakingly intricate detail. Rashawn is a member of the National Conference of Artists and the Detroit Fine Arts Breakfast Club. Ameriss Campbell, age 11, has been painting for four years and drawing since she was three years old! Ameriss also writes short stories and loves to draw the illustrations for her stories. Ameriss’ maternal grandmother, Vicki Hart, attended Center for Creative Studies for a time and subsequently taught Ameriss’ mother, Rashawn Hart-Campbell, to paint at a very young age. When asked about her love for art, Ameriss often mentions her art teacher, Ms. Alverson, from Hillside Elementary School in Farmington Hills. Ameriss was a part of the Farmington Public Schools Art Exhibit in 2017 at the Maxfield Education Center. Ameriss received honorable mention for a self portrait in the 2016-2017 Farmington Public Schools art competition, “What’s Your Story?” and placed third place in the 2015-2016 FPS art competition, “Let Your Imagination Fly”! Ameriss now attends Macomb Montessori where she excels in reading, writing and art. She regularly attends the weekly meetings of the Detroit Fine Arts Breakfast Club with her mother, artist Rashawn Hart-Campbell. Indigo Campbell, age 9, has been painting for four years! She does not describe herself as a painter; she is however a true creative. Indigo loves sculpture, finger painting, photography and helping her sister make small films on their tablets. Indigo Campbell’s maternal grandmother attended Center for Creative studies and taught her children art at an early age. Indigo subsequently received an art education from her mother, artist Rashawn Hart-Campbell. In 2015 Indigo received Honorable Mention in the Farmington Public Schools “Let Your Imagination Fly” themed art competition for her acrylic painting on canvas titled, Flower. In 2016 Indigo received a participation medal for the “What’s Your Story” themed art competition also for FPS! Indigo regularly attends the Monday meetings for the Detroit Fine Arts Breakfast Club with her mother Rashawn Hart-Campbell. Indigo presently attends Macomb Montessori Elementary School and excels at math and art! Miles Campbell has in fact been painting for over 2 years. He prefers acrylic paints to other mediums and often includes pencil drawings and spray techniques in his artistry. Miles attends Macomb Montessori Elementary School where he excels in Math and is in the first grade. Miles received a participation medal for the Farmington Public Schools Art Competition in 2016 for his acrylic on canvas painting titled “Robin", painted in bold brush strokes of deep red and highlights of blue. 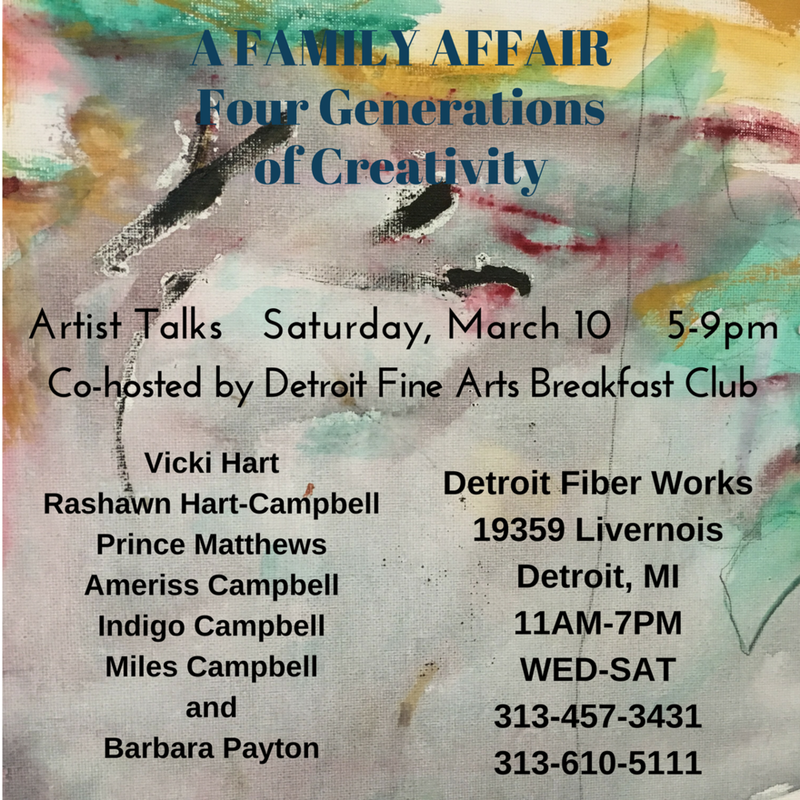 Miles regularly attends the Monday meetings for the Detroit Fine Arts Breakfast Club with his mother, artist Rashawn Hart-Campbell, and his grandmother, artist Vicki Hart.